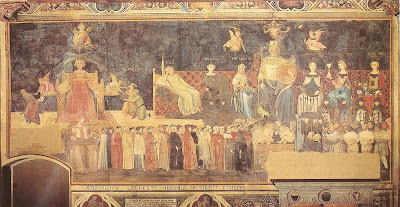 For the past sixty years the Republic of Siena had been at the summit of its fortunes. It was desirous of immortalizing the memory of its greatness. 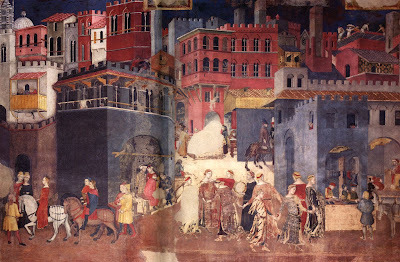 From this point of view the frescoes of Ambrogio are of great interest; this is perhaps the first example of lay painting and of art used to represent ideas and life, without any religious conception. It was a course in Aristotelean philosophy and at the same time a hymn to the city. The composition is developed on three walls, forming a sort of triptych. 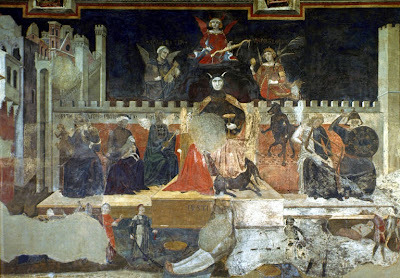 The middle fresco displays under a dogmatic form the ideal of democracy. The Virtues which direct the State are seated on a platform; this is the tribunal or the legislative assembly. The most famous of these figures is that of Peace, which, reclining on her throne in magnificent drapery and resting on her arms, is certainly imitated from an antique medal or statue (such imitations are not rare in the thirteenth century: cf. the sculptures of Capua, the work of Giovanni Pisano, and some statues at Reims). But the other figures are little more than abstractions and can be identified only with the adventitious aid of a multitude of inscriptions, devices, and phylacteries. On the other two walls are similarly developed the effects of good or evil social hygiene. After the theory follows the application. The left wall (Evil Government) is unfortunately almost ruined. But the opposite one, which is more intelligible, suffices to convey an idea of the painter's method. 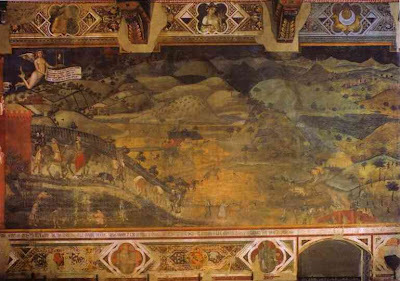 The length of the painting is divided into two halves, one of which shows the city and the other the country. And in each of these parts is a host of episodes, a great collection of little pictures of manners, which analyse in a thousand ways the condition of a happy society. The general idea is resolved into a multitude of anecdotes. We see dances, banquets, children at school, weddings, some peasants leading their asses to market while others are tilling the ground; in the distance is a port whence vessels are sailing away. 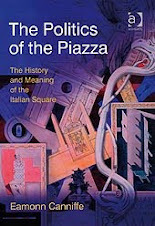 All these various scenes are most entertaining and furnish much information about Sienese life and customs in the Middle Ages. But one is lost in the complexity of this chronicle and the confusion of this journal. The result is an extremely curious work, though one almost devoid of artistic value.